We Met Our Kickstarter Goal! Thanks to the generous support of 731 backers, we surpassed our Kickstarter goal and raised $53,088 toward the production of ON MEDITATION. This outpouring of generosity is beyond anything that we had hoped for, and we are so grateful to each and every one of you who took a leap of faith and supported ON MEDITATION. The campaign has been an incredible journey, but it’s not over! In fact, we’re just getting started on the next phase of production for ON MEDITATION: We recently wrapped a great day of shooting with film director and meditation advocate David Lynch and we’re in pre-production for our next shoot with motivational speaker, life coach, and author Gabrielle Bernstein. We are astonished and grateful and, above all, inspired by your support. And, if you missed the opportunity to join our Kickstarter campaign or would like to make an additional donation to our project, we are continuing to raise funds for ON MEDITATION. Click here to find out more about how you can contribute. We're super excited to announce that Gabrielle Bernstein has just agreed to be a featured portrait in ON MEDITATION. Gabrielle is a leading expert on yoga and meditation and the New York Times bestselling author of the book MAY CAUSE MIRACLES: A 40-day Guidebook of Subtle Shifts for Radical Change and Unlimited Happiness. Youtube named her one of their 16 Youtube Next Video Bloggers and she was named one of Mashable’s 11 Must-Follow Twitter Accounts for Inspiration. We're honored to have Gabrielle's participation. Now, that David Lynch and Gabrielle Bernstein are lined up for shooting your support is more important than ever. Please make a contribution today to help keep ON MEDITATION in production. Your support will allow us to keep shooting and connect more people to this simple, healing practice through our unique film project. The aim of ON MEDITATION is to demystify meditation for a mainstream audience. There was a great article published on Sunday in the Columbus Dispatch about Ohio Rep. Tim Ryan (above), one of our heroes in the meditation movement (he also just happens to be one of the subjects of ON MEDITATION). The article discusses Ryan's personal commitment to mindfulness meditation and how it has influenced his policy agenda, including bringing the benefits of meditation to schools. Ryan spearheaded nearly $1 million in funding for a pilot program on a Social Emotional Learning curriculum including mindfulness meditation. The funding has been used to introduce meditation in schools, including a "peace corner" for children experiencing conflict in the classroom. The subject of CHILDREN AND MEDITATION is very dear to our hearts. In fact, one of the goals of ON MEDITATION is to make sure the films reach children. That's why reason why we've pledged to give away ON MEDITATION to schools for every advance copy of ON MEDITATION that is backed on Kickstarter. We've raised more than $13,000 since the start of our campaign. Please help us achieve our $50,000 goal by making a contribution today and spreading the word. Thank you for your support! 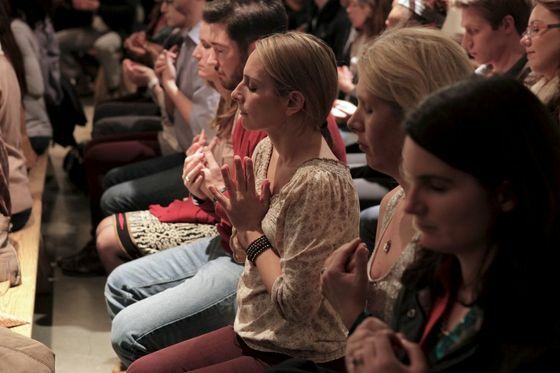 We had a great turnout Thursday night for an ON MEDITATION event at Milk Studios in New York City. More than 250 friends, family, and kindred spirits turned out for a fantastic evening to celebrate ON MEDITATION and support our Kickstarter campaign. As part of the event, we shared a few clips from ON MEDITATION, were treated to a beautiful live performance by our composer Garth Stevenson and then a delicious guided meditation with Elena. The evening was an unusual blend of MOVIES, MUSIC and MEDITATION. Unforgettable. Special thanks to Lululemon Meatpacking for helping make this exciting event possible! We are making incredible strides in our Kickstarter campaign. We deeply value your ongoing support. We can't do it without you! Friends and Supporters... check out our new promo featuring none-other-than BREAKING BAD'S Gustavo Fring aka Giancarlo Esposito. Ever wonder how Giancarlo prepared for his now iconic role as the ruthless meth dealer? You guessed it... he got connected to his breath. You'll have to wait to see ON MEDITATION when it's finished to get the full scoop but in the meantime we thought you might enjoy this. Please share with your friends and help spread the word about our Kickstarter campaign, which is raising the critical funds needed to continue making these films. We need your support! LOVE AND GRATITUDE from the ON MEDITATION team.